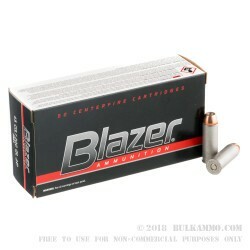 Blazer CCI ammunition is one of the most trusted names in ammunition. It is owned by ATK and which is an American manufacturing company, so you can trust the quality of this ammo. 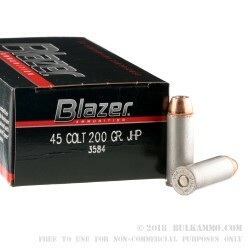 They provide bullets to many different law enforcement agencies around the United States and have become a premier choice when it comes to general purpose, self-defense and plinking bullets. 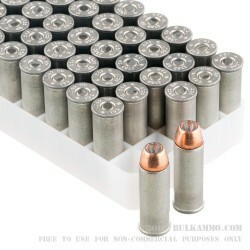 This hard to find .45 long Colt Ammo is available for the serious shooter. 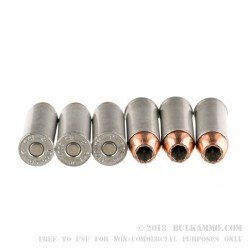 The bullet weight is 200 grains and features a jacketed hollow point. The Jacketed hollow point is the best round for self-defense, as it provides maximum damage on impact. Making this the clear choice for your everyday carry or personal defense weapon. It comes cased in an aluminum alloy casing, it has a Berdan primer and has non corrosive powder. With a muzzle velocity of 1000 feet per second, you can be sure that it will deliver the right amount of force to any intruder. This comes with 50 rounds per box. Make sure you purchase in bulk because this ammo is hard to come by, and when it comes to self-defense it is important to be prepared.